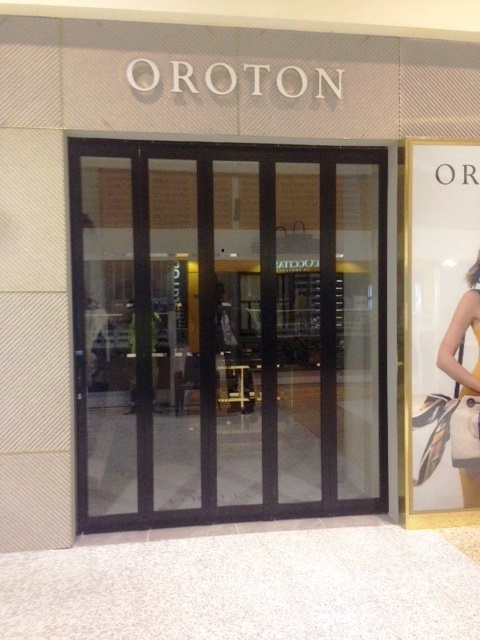 Mirage doors have recently completed the supply and installation of a Fiesta door at the Oroton shop in Sydney’s T3 Domestic Terminal. 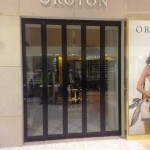 Oroton wanted a product that is easy to use and that would showcase their latest airport store. The Mirage Fiesta Stacking Door fitted those requirements and was selected. The door stacks off to a stacking portal on one side via our Parallel tracking system. This type of tracking system allows for the doors to be moved in a parallel state and then simply stack back at 45 deg in the cupboard. Each panel is unique and consists of 6.38mm laminated glass encased in an aluminium powdercoated frame. The product can be tailor made to suite any size opening or application.